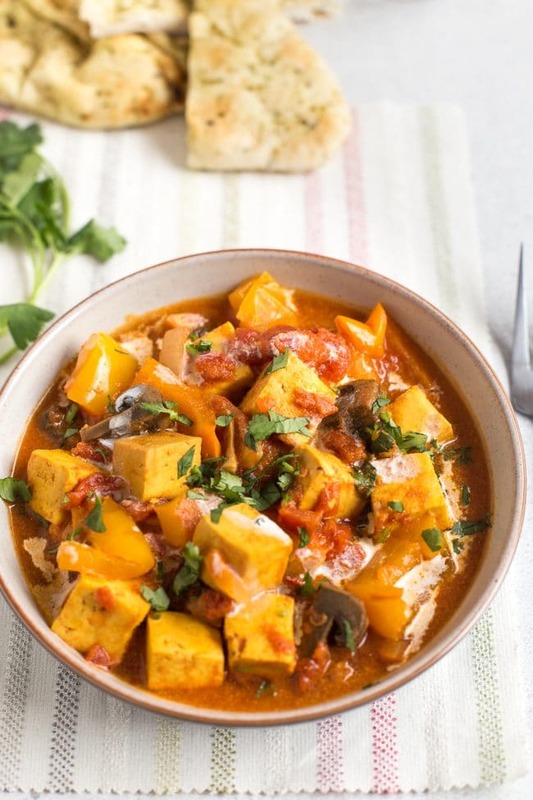 A really easy vegetarian curry that's full of flavour - just throw all the ingredients for this paneer tikka masala in the slow cooker, and leave it to do its thing! Hello slow cooker! 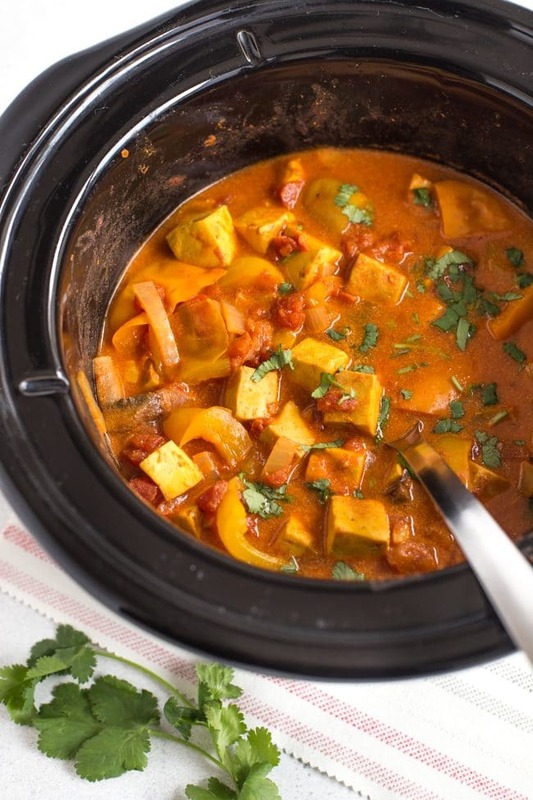 I thought it was time to bring my old friend out of retirement again to make this slow cooker paneer tikka masala. I only use my slow cooker every now and then, but it’s such a handy way to make a hearty dinner with very little effort. 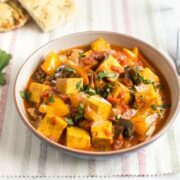 There’s no pre-cooking needed with this vegetarian curry recipe – just throw some raw veggies and some chunks of paneer into the slow cooker, and leave it to cook. Easy peasy. 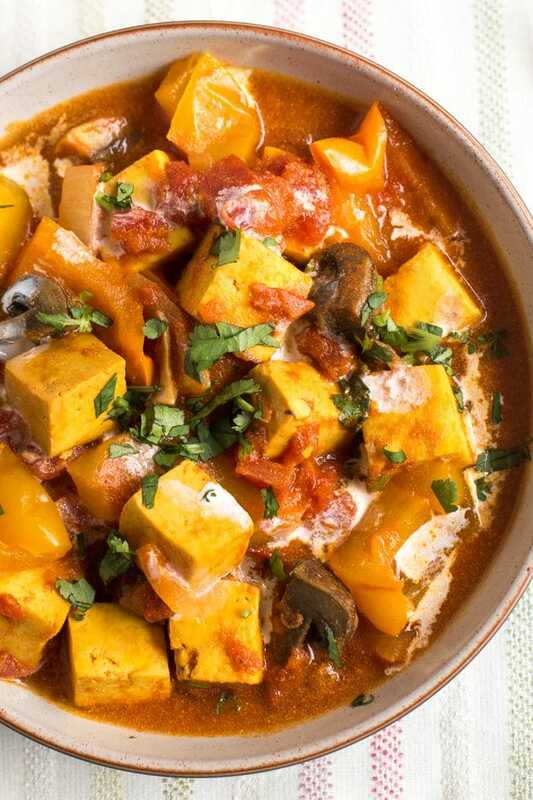 If you’ve never had paneer before, it’s an Indian cheese that’s often used in vegetarian curries. 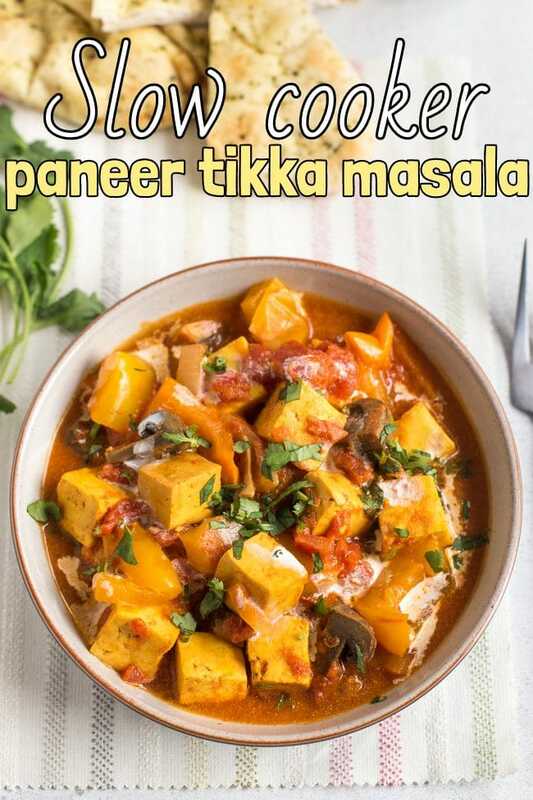 But don’t go imagining big chunks of cheddar or anything – paneer is much milder and creamier, so it doesn’t feel overly heavy (I’m an enormous cheddar fan, but even I wouldn’t stick a whole block in a curry). Its mild flavour means it takes on whatever flavours you cook it in, so it’s really versatile – any kind of sauce will work really well with it. My tikka masala sauce is really tasty, without being super spicy. The main base is tomatoes, with garlic, ginger, cumin, paprika, coriander, turmeric… heaps of flavour with very little effort. It sounds like a lot of different spices, but these are the same basic ingredients I use in pretty much all of my curry recipes – I’ve never claimed I make authentic Indian curries, but I do make tasty and straightforward vegetarian food! I reckon you could stock your spice cupboard with less than 10 jars, and you’d have pretty much everything you need. I have a ton of random stuff in my spice cupboard, but I still find myself using the same things over and over again. Since my paneer tikka masala is made in a slow cooker, it does end up a bit soupier than a standard curry. 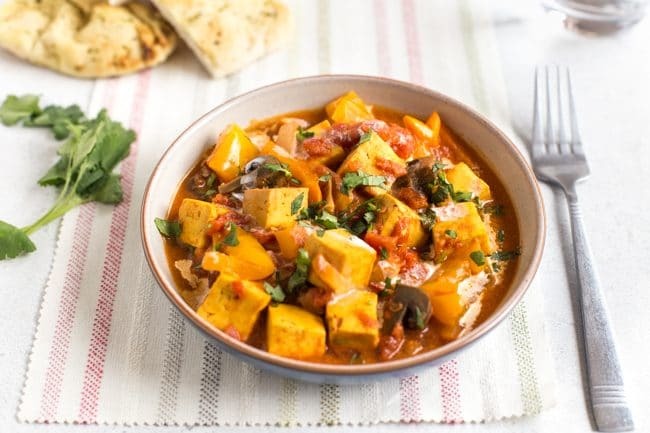 If you’d prefer a thicker sauce, you could always make this on the stove-top instead – but personally, I thought the thinner sauce was a good excuse to use a big chunk of naan bread to mop up the bowl (not that you need an excuse!). When your slow cooker paneer tikka masala is cooked, finish it off with a good glug of cream and a sprinkling of fresh coriander (cilantro) – and don’t forget the rice and naan bread! Oh, and a few onion bhajis. And maybe a samosa or two. Ooh, and poppadoms! Okay, I’ll stop. Just make the curry. Add the first 11 ingredients (paneer through ground coriander) to the slow cooker, and add a generous pinch of salt and pepper. Mix well, and cook on high for 4.5 - 5 hours, until the vegetables are all soft. Bit more pressed for time? 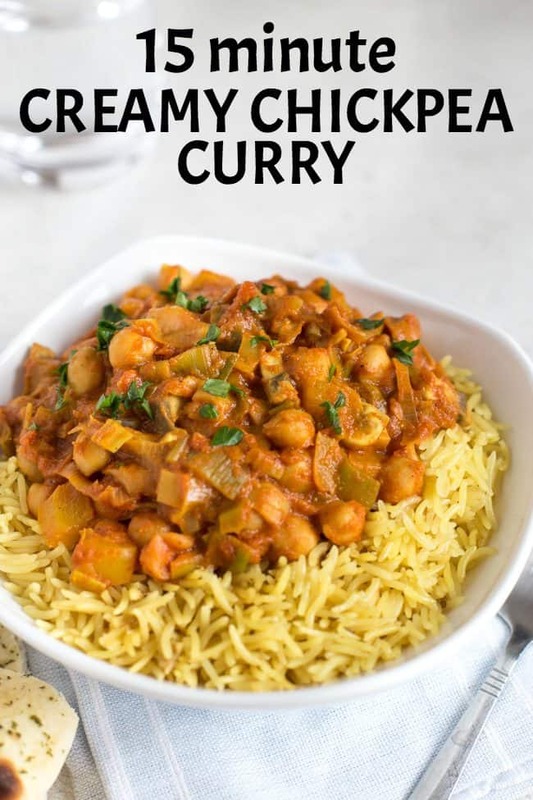 My easy creamy chickpea curry can be whipped up in just 15 minutes! I’m becoming much more aware of what I puit in my body is what I become, and Im trying to eliminate most if not all meat products. It’s going to take a bit of time, but for now I will be happy to eliminate most of the junk foods I’ve become accdustomed to the last 40 odd years, and turn to raw veggies and fruits.. all organic by the way.. 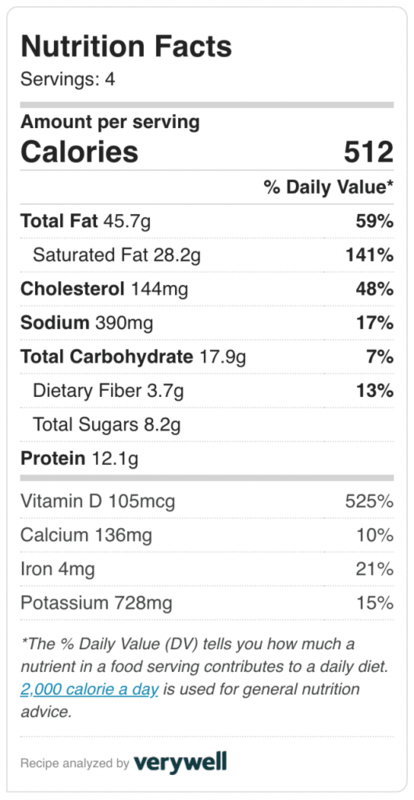 So, that asid,e I’m looking for veggie recipes that appeal, and I can be a bit picky, but this one jumped out. I probably won’t have all the ingredients as I don’t like some of them, but looking forward to try this one out.. so.. thanks! This is completely a new recipe for me with slow cooker. Hope it will yummy and Will try soon. Thanks so much for this recipe. I’m really looking forward to trying it!!! Thanks Michael! I neglect mine too much too, but I always enjoy using it! I am always looking for slow cooker recipes. Love mine and make soup weekly with it. This looks really good, I am going to try it this week!